Katara can manipulate water. She can make rise, fall and take shape. She and her older brother Sokka are out hunting on the frozen landscape near their village. They spot something in the ice and Katara uses her power to set it free. Contained in the giant ice bubble are a young boy and a huge furry creature with a saddle. They take the boy home and notice his body is covered in elaborate tattoos. Katara suspects that the boy may be the last Avatar. The world is divided up into for nations, Air, Water, Earth and Fire. Each nation has a population that can “bend” or control their particular elements. The Fire nation in an attempt to control the world has waged war, banning the conquered nations the use of their powers. Katara (Nicola Peltz) is the last water bender of the Southern Water Tribes. Her brother Sokka (Jackson Rathbone) is her only family. Their mother was taken prisoner and killed by the Fire nation. Legend has it that the Avatar, an Airbender with the ability to control all the elements will be able to restore balance to the world. 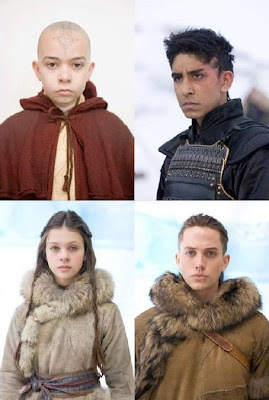 Aang (Noah Ringer) is the latest reincarnation of the long line of avatars before them. He was once a student but had run from his teachers when he discovered that he would not be able to have a normal life and family. He is unaware that over 100 years had passed while he was trapped in the ice. His temple, home and companions have long since been destroyed by the Fire Nation. The exiled son the Fire nation king Prince Zuko (Dev Patel) believes that capturing the last Airbender will bring him back his honor in his father’s eyes. He takes Aang from the village by threat and violence. Katara feels responsibility for Aang since they are the ones that freed him from the ice. After Aang escapes, he confesses to Katara and Sokka that he ran away from the temple before he learned how to control all the elements. They decide to seek help from the Northern Waterbender nation what has been able to survive being taken over Fire peoples. It is here that Aang develops his talents and reconciles his destiny when the Fire Nation comes to destroy him. With M. Night Shyamalan writing and directing this feature, there’s a 50/50 chance of success. He has yet to duplicate the success of The Sixth Sense or Signs. This film is a totally different genre with an Asian Lord of the Rings kind of world. The martial arts and special effects look great in the beautifully colored and created world of The Avatar. Most of the bender’s exercises look like Tai Chi. The action scenes are the by the numbers formula almost like a video game. As visually captivating as it is, it’s also fairly predictable. At times the story seems rushed and details piled on. If you don’t pay too close attention you may miss some plot points. The acting and pacing is stiff, the dialogue is both vague and obvious. But you know that Fire dudes are bad because they wear black, their big metal ships spew smoke and ash and they want to kill the moon spirit. The film is set up for the next two chapters to come with a devious plot unfolding in the last scene. The Last Airbender is not perfect, but M. Night Shyamalan sort of redeems himself and makes us forget The Village.